At a time when thoughts are perhaps looking forward to next year’s garden I thought I would promote one of my many ‘favourite plants’ I have in my garden. If you are browsing the plant catalogues perhaps this post may just tempt you to consider growing Alliums. You may need to pour up a coffee for this post. Sorry, I just love to chat about plants and have enjoyed many planting schemes over the years in my garden and those of family and friends. Christophii, Purple Sensation and Silver Queen shown above, left to right, show why the Allium has become a favourite of many garden designers in show gardens for a number of years now. The globes of flower are great accents of both form and colour. 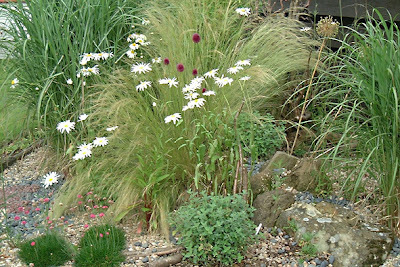 Once plants appear in show gardens they often become fashionable. I have to say though it wasn’t a show garden that got me hooked. It was a visit to the great plantswoman, Beth Chatto’s Garden outside Colchester where I first saw this plant twelve years ago. In fact I found many of her plants and planting schemes very inspiring and would strongly recommend a visit there. She has written a number of books and also has a Nursery! Christophii was the first allium I grew in my garden. Its globes of star-like flowers are just fantastic as they open and then go to seed. I love to watch them through all the stages. 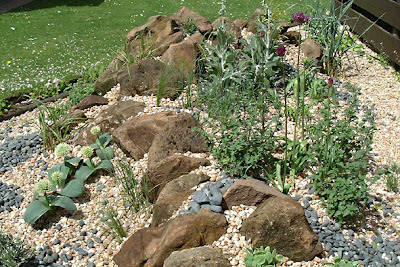 The larger photo above, taken of my front garden, shows a deep charcoal grey pot on the right hand side which has a group planting. This really makes an impact at the gate entrance to my back garden especially with the dark wood stain in the background. Purple Sensation is the perfect scale of flower for my front garden and looks brilliant in drifts of planting as you can see in the photos above. By the time it changes to seed heads the grasses grow up to meet it and it looks like it is just dancing on top of them. It compliments the grasses so well. The opening flowers hold so much interest for me too as they all come into flower at slightly different times as you can see with Purple Sensation again in the main photo above. Perhaps as they have a gravel mulch the planting depth could vary and that is how I get this. The smaller photos show the bud of the Christophii and the Drumstick Allium and how it starts green and gets darker until it fully becomes a deep pink colour. I have given great thought to what photos to show for this post and in all honesty they took some time to find on my PC – I should sort my filing system. However although I have close-up shots with my new camera I felt they and those in the catalogues don’t given anywhere near a good enough feel for this plant as seeing them in a garden setting. So, although some of these photos are old I think they do the trick nicely. May 21st 2002, shown in the photo above, you can see how my plantings of Alliums were growing. Notice how they had began to self seed too through the gravel mulch. It takes a few years before they flower but a great way to get natural planting. This area was light and airy then and really has gone through many changes in the sixteen years that I have gardened here. Two years later on June 10th 2004 this area looks quite different as you can see above. The grasses had grown and I had a notion of planting large groups of Poppies and grew them and the Foxgloves all from seed. 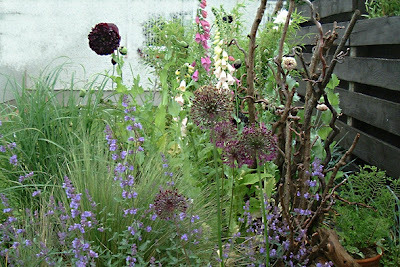 You can see how the deep dark Poppies complimented the purple sensation alliums. The purple blue flowers of the Nepata, having grown in size since then, added so much to this rich mix of colours. Two months on in August 2004 and again this area has changed quite dramatically as you can see above. The Nepata had been cut back so I would get a second flush of colour later in the summer and you can now see the small clumps of thrift in flower with tiny pink dots of colour. I added that especially to tie in with the Alliums. The Purple Sensation Alliums had now finished flowering and it is the turn of the Drumstick Alliums. The Poppies have finished flowering and the white Shasta Daisies now add their flat umbrella flowers lighting up any remaining Alliums. I think it is great how the garden can completely change through the seasons. Pale pink with more open globes are a few Alliums at my front door in another much smaller gravel bed with grasses and Euphorbia. They are very delicate as you can see in the photo and bud shown above but I’m afraid I’m not sure what they are – I will need to look up my labels box to see if I have one. The pale blue allium, shown above, was seen growing in my back garden all on its lonely – I must have moved another plant and taken it with it! Open and sunny is my front garden but behind the garden gate is another garden entirely. Partial shade is probably accurate for my whole back garden. This is where my Japanese Anemones grow very happily but so do the Alliums. They look completely different with the lush green and golden foliage as you can see in my final photos above. However they are still great accents of form and colour. When I have mentioned in my Garden Bloom Day posts that I have dots of colour I have meant exactly that! All photos above were taken in my garden using a mixture of cameras. In my garden there are also alliums growing, as I am very fond of this wonderful plant (however I only started 3 years ago). Actually there are still some bulbs waiting to be planted now!! Your post was a great treat and I liked your pictures very much. You're preaching to the choir Shirl. ;-)Like you I love alliums and have many in my garden. Thanks for all the lovely pics of all the alliums in your garden! Hi, Shirl. Can you believe that I have never had alliums in my garden? I've already planned to change that since I planted bulbs this fall for the first time. Hopefully, they will do well and I'll get to experience this first hand. I mentioned you on my blog today. Remember the starling? Well, it brought friends today. Love your garden pictures Shirl. I have tried many different types of alliums and have not had any luck with them lasting more than a year or two. What with me paying so much for them I have given up this plant. I have read that they like cold winters so possibly that is my problem. Our winters don't usually get cold enough for them??? I have yet to meet an allium I didn't like (except maybe a. moly--I can't really work my way around that yellow color) but your pictures make me wish that I had sited mine better when I planted them this fall! I wasn’t sure if I had remembered seeing Alliums in your garden – I will look forward to seeing your latest plantings next year. I have more to plant myself after picking them up and half price – I also have some more anemones that I picked up as an even bigger bargain!